Sheldon Wilson’s directorial debut horror film, the cult hit 'SHALLOW GROUND' (2004), was an extraordinary, groundbreaking genre movie. Achieving incredible results from a very low budget, it won the Best Feature prize at Edinburgh’s prestigious Dead By Dawn film festival and was described by Empire magazine as having “a grim wit, grisly edge, creepy score and a disconcerting denouement”. With his latest terror outing, pairing with the producer of the Insidious and Paranormal Activity films, Wilson has done it again with this supremely scary haunted house flick, taking elements of horror classics like The Amityville Horror and The Haunting and blending them into something creepily original. 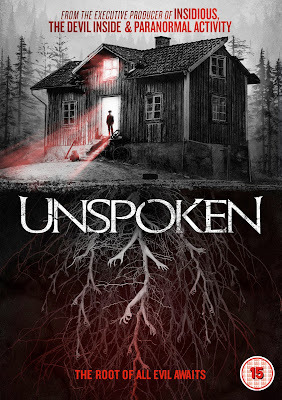 Starring Jodelle Ferland (who horror fans will recognise as the iconic girl from Silent Hill) as the teenager with the uneviable task of babysitting in a very unnerving spook house, 'UNSPOKEN' delivers a healthy dose of chills and packs a staggering twist that gives M Night Shyamalan a run for his money. 'UNSPOKEN' received its world premiere at the 2015 London Halloween Frightfest and is now likely to scare up plenty of business with its DVD debut. When new arrivals in town, Jeanie and her nine year old daughter Adrian, move into the house, they are unaware of its grisly past. But before long the local Sheriff calls, investigating recent reports of animal sacrifices, apparitions and other sinister events. It seems that the past is still very much in the present and the new tenants must now face a fight for survival in this terrifying ghost story with an insidious sting in its tail.